Design Data will open its doors to the AEC community, as well as local students, as part of SteelDay 2009, sponsored by the American Institute of Steel Construction (AISC). The first-ever SteelDay will be held on Friday, September 18th, at numerous locations across the United States. The goal of SteelDay 2009 is to involve and educate owners, architects, engineers and students on the major features and benefits of structural steel through interaction with the steel industry. 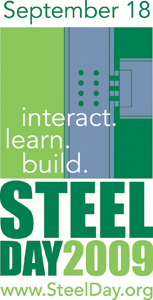 SteelDay will be an interactive day with the structural steel industry. Steel fabricators, mills, service centers and others in our industry will open their facilities, jobsites and offices, offering tours and inviting the AEC community, schools, universities and the general public in to see what we do and how we do it. As part of the day's events, Design Data will hold educational sessions on technical topics of interest to the AEC industry. Additional details on these events will be featured in future articles. To learn more about what you can to do participate in SteelDay, contact Michelle Eret at 402.441.4000.